Maggie Holmes. Enough said, right? She always has the most beautiful collections and I just have to have them all! It was no exception with the Willow Lane Collection. I love the butterflies in this collection and thought it would pair well with the Flutterby Cut File from The Cut Shoppe. I started by slicing apart the Flutterby Cut File in Cricut Design Space and cut a single butterfly three times in three different 6×8 Willow Lane Patterned Papers. I also used the contour feature in Design Space to create a solid butterfly from the same cut file. I cut the solid butterfly three times in vellum and used the vellum butterflies to back the patterned papers. I then added a straight stitch down the center of the butterflies for extra texture and dimension. I love how the wings naturally lift off the page. I grabbed my favorite 12×12 Patterned Paper from the Willow Lane Collection to use as my background. While I absolutely love Crate Paper, I sometimes struggle to use the ephemera packs because a majority of the die cuts are so large. So even though I absolutely love the Willow Lane Collection, I didn’t purchase any of the die cuts so I needed to come up with a way to embellish the layout. Thankfully there are numerous patterned papers in this collection that can be fussy cut to create your own embellishments. With that thought in mind, I fussy cut numerous butterflies from the Flutter Patterned Paper, and I also cut a bunch of the florals from the 6×8 Paper Pad. I printed a couple of photos of our guinea pigs and positioned them in the center of the layout. I added the Flutterby Cut File butterflies along with the fussy cut butterflies & florals. I added buttons, in coordinating colors, from my stash for added dimension. The title is a combo of Thickers from 1 Canoe 2 and the Crate Paper Cute Girl Collection. I added my journaling using my We R Memory Keepers Typecast Typewriter. I tend to mention my journaling last in all of my blog posts, but it takes a little planning when I plan on adding it directly to my 12×12 backgrounds. I have to add the journaling before adhering anything down to the background or it will never pass through the typewriter. Aidan, my son, was desperately wanting a pet of his own. We already have a zoo with 2 cats and 3 dogs, but he was dying to get either a rabbit or guinea pig. After doing a little research a pair of guinea pigs seemed like the best fit. Aidan, along with my niece, picked out these two girls. It’s been interesting, but I’m so proud of how responsible Aidan has been. I felt like I needed to add a little something to the top & bottom of the layout so I added a couple more butterflies & florals. I also added a few tiny phrase stickers from an older Maggie Holmes Collection. With a few splashes of Gold Heidi Swapp Color Shine this layout was complete. 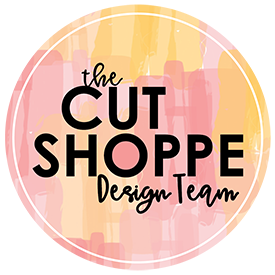 Remember to visit The Cut Shoppe Etsy Store to check out all of the cut files! You won’t be disappointed!